Remember that your decision to adopt should be based on your lifestyle and the lifestyle of your family and not based on how cute or cuddly a particular rescue dog may look. Dog ownership is a huge commitment and a big responsibility so you should take your time and avoid a rushed decision. Be aware that many rescue dogs have a somewhat turbulent past which may require extra attention to training and behavior modification. 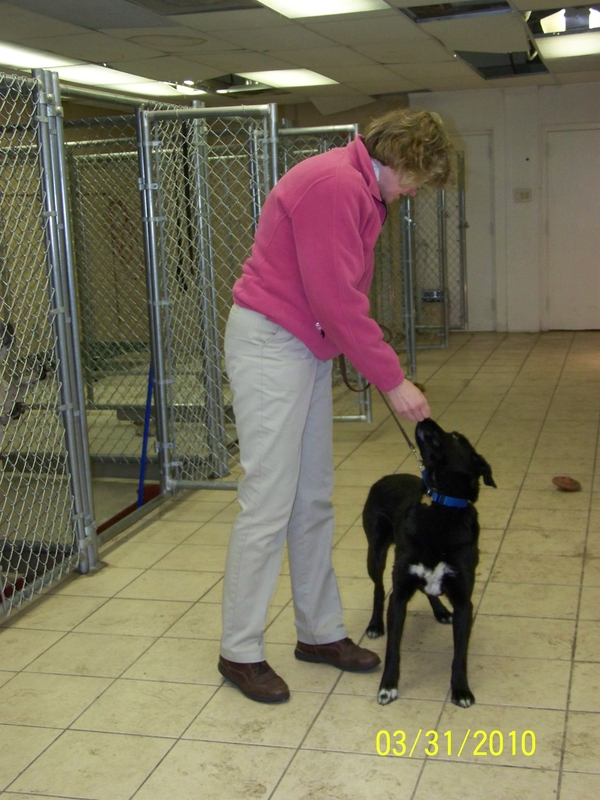 You must be prepared to spend the necessary time that may be needed to ensure stability in your new dog. It is also very important to make an informed decision on adopting a particular dog. Ask questions about background, prior owners, etc. It is very easy to make a decision based on emotion when the sad eyes and scared faces are tugging at your heartstrings. However, this can be a recipe for disaster. It is your job to make a sound decision based on breed research, stability and appropriateness of temperament for your family. If you are full of emotion, you cannot make a sound decision and your family and your new companion will suffer as a result. So be sure to resist any decision that is based purely on emotion. I cannot stress enough the importance of analyzing your lifestyle and choosing a dog that matches your energy level. For example, a less active family should not choose a high energy dog that requires lots of exercise. A more active family should choose a dog that is able to join your family functions and is capable of being very social. If a low energy family chooses a dog that has high energy, both family and dog will suffer greatly and behavioral issues are sure to arise. Many dogs are returned to the rescue group or humanely euthanized due to the owner’s inability to control behaviors that are a result of a bad match between the dog’s activity level and temperament and the family’s social structure and activity level. Don’t let this happen to you! You want to make sure your new dog would have a forever home. 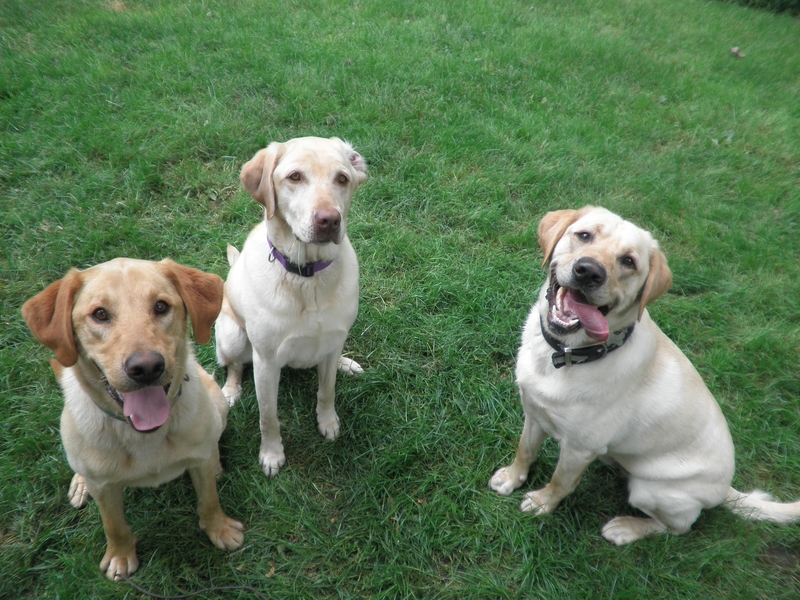 I have personally adopted three dogs and they all have brought great joy into my life. In fact my first dog was a stray found on Ryan Rd. We called him “Ryan”. 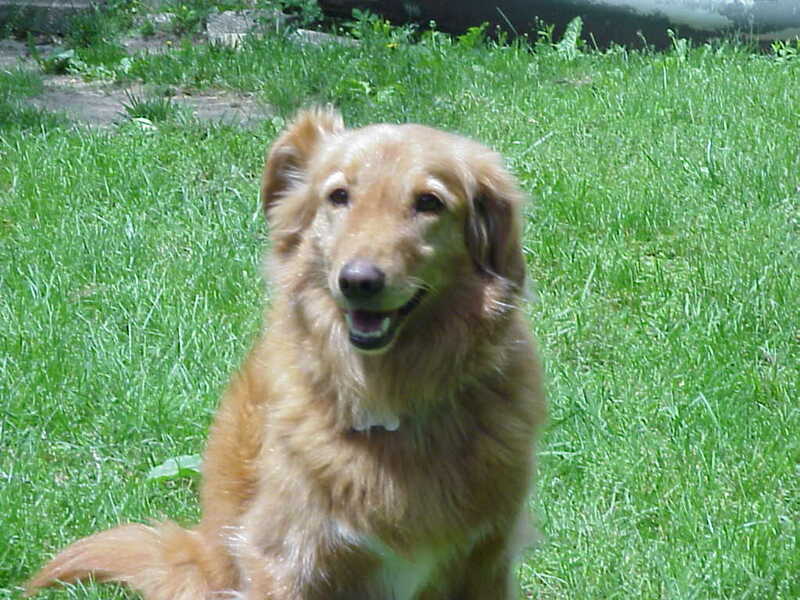 I also adopted a Nova Scotia Duck Tolling Retriever named Rivie. She became a certified Therapy Dog. Currently I have Windy my big yellow Labrador. What a great dog. Some of the biggest problems with Duke were that he jumped on people and mouthed them. He never learned as a puppy that you don’t put teeth on skin. He basically never learned any manners. 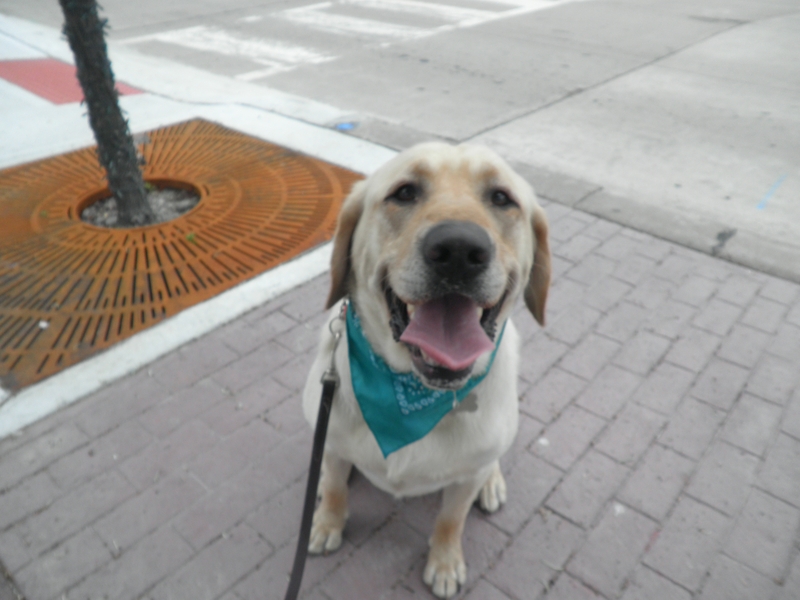 Duke is a very energetic dog and the easiest way for him to burn off some of his energy is to play with other dogs. This is often also the best way to teach a dog, manners. If he is constantly mouthing and jumping on other dogs they will either put him in his place or will stop playing with him. This is exactly what happened. 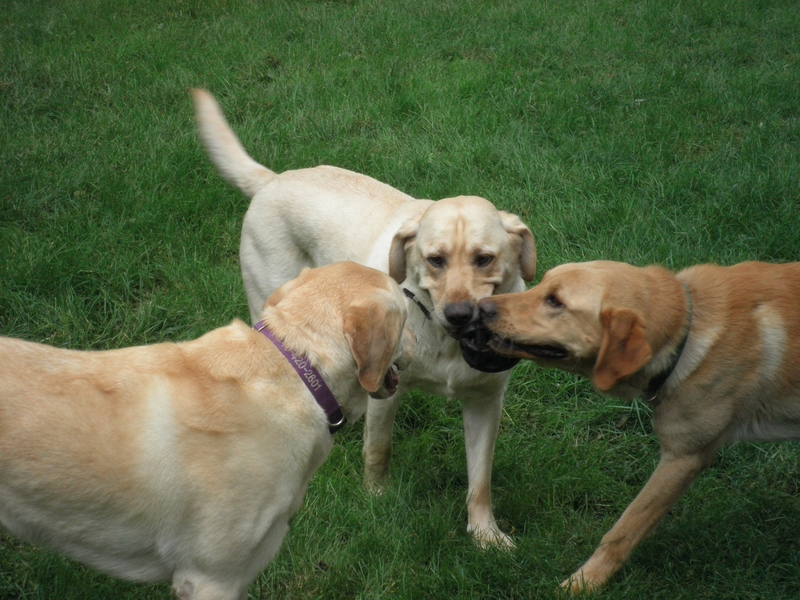 By the second day of interacting with my pack of dogs he started to play nice. 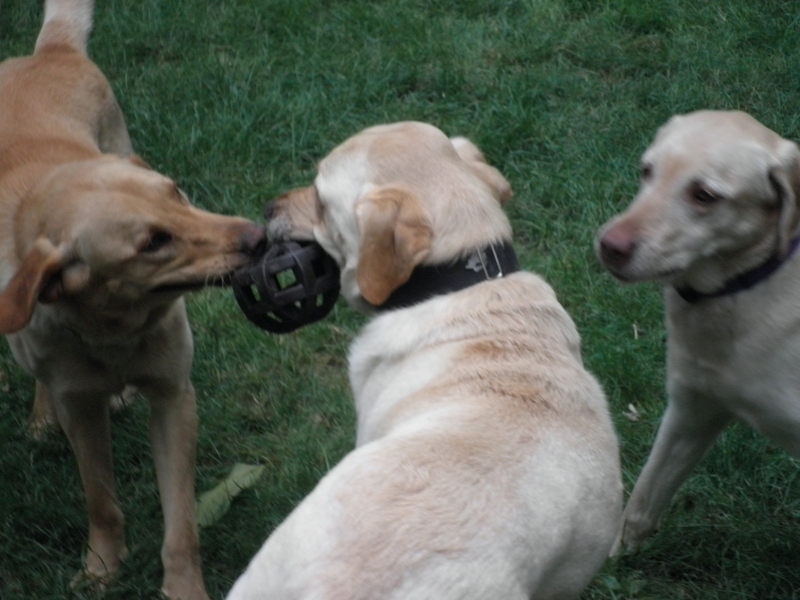 My pack consists of Windy (a yellow lab), Eclispe (black Lab), Fireball (a Toller) and Isaac (a yellow Lab). Now I did have to correct him a few times for jumping on me in the beginning, but it has been at least 4 days since he tried to jump. My goal now is take him out in public to let him understand that he can’t jump or mouth anyone. I have never met a dog that is starving to learn. I think back to when I picked up Duke from the kennel. He was jumping, running in 10 different directions and seeming oblivious to anyone or anything around him. Can We Wash the Dishes for You? After a week I see a very sensitive and intelligent dog that just wants to please. When training a dog you first show them what you want, than use it (proof) and finally expect it. For Duke once you show him what you want and he understands. He just does it. Here is an example. I always make them sit stay at the back door to go outside. If I say, “Let’s go outside.” Duke races to the back door and sits waiting for me to open the door. It is amazing. He always looks at me with this look on his face as if to say, “What do you want me to do? I can just imagine him with someone who wants a working companion, a jogging buddy or a dog that will walk next to the stroller while Mom and baby go for a walk. What a life Duke may have in the future. Isaac is doing great and has learned all the basic commands. His two biggest challenges were stay and come. Initially he would sit and do down, but stay. He really thought he had more important things to do. There are action exercises and control exercises. Stay is control and Isaac is a little strong willed. ( stubborn.) Isaac likes things his way. I guess who doesn’t. The good thing is that his resistance is more passive. He knows he is big and that it is hard to make him do anything. We had many many sessions with the stay and he is still struggling with the down stay, but is 100% better. Originally he would go down for a cookie and than jump back up, even before he received the cookie. Do I Have to Come in Now? I have really been working on making him come and twice yesterday while playing with Duke (the foster dog), Isaac stopped playing and came. It is working. The good news is that he hasn’t tried to jump the fence. I am very grateful that there have been several opportunities to test this. One morning he was outside and a poor baby Robin was in the yard. He initially picked up the baby bird. A stern drop and he did. I gently put the bird on the other side of the fence and he though he really wanted to get to the bird. He didn’t jump. The last thing that we are doing is working on “place” and simply making sure that he is doing all exercises perfectly.